Tired of the Constant Flow of Negativity? I am. Let’s share a few moments – of hope, healing, and happiness. Let’s choose the resilient option. A tweet or two might be the perfect side helping. You might enjoy a Vlog post – an integration of science with timeless principles. FEELING GOOD OR FEELING AUTHENTIC? Sometimes (or often) feeling authentic can be more healing than feeling good. SOMEONE UNGRATEFUL IN YOUR LIFE? Sometimes the ungrateful can’t help it. WHO IS REDESIGNING YOUR BRAIN? People who you listen to, change the wiring of your brain. CAN CRYING BE A GOOD THING? Crying helps you heal emotionally, as well as physically. Bring the wisdom of wellbeing research into your life. Each spring, the crabapple tree in our backyard flowers, fruits, and come fall - sheds it all. Three simple exercises, consistently practiced can transform our lives and relationships. In for a deeper Dive? ...and connecting with us in person. INTERESTED IN becoming a trainer or BRINGING RESILIENCE AND WELLBEING TO YOUR ORGANIZATION? We are engaging with several different groups to help decrease stress and burnout, and enhance resilience, mindfulness, happiness, and performance. Please access resiliencetrainer.com for additional information. Click on the image to see more details. 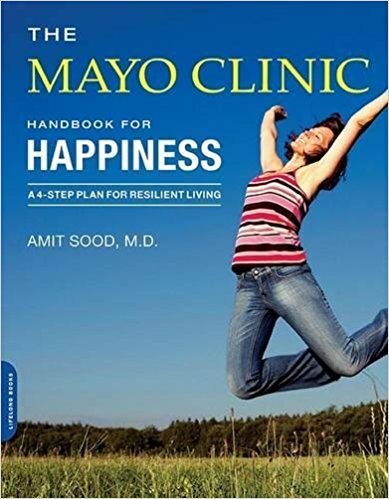 Dr. Amit Sood is a former Professor of Medicine at Mayo Clinic, former director of the Mind-Body Medicine Initiative and chair for student life and wellness. He is the creator of the Mayo Clinic Healthy Living Resilient Mind program and has authored multiple books including The Mayo Clinic Guide to Stress-Free Living, The Mayo Clinic Handbook for Happiness, Immerse: A 52-Week Course in Resilient Living, and Mindfulness Redesigned for the Twenty-First Century. Dr. Sood received the 2010 Distinguished Service Award, the 2010 Innovator of the Year Award, the 2013 Outstanding Physician Scientist Award, and the 2016 Faculty of the Year Award from Mayo Clinic. He was honored as the Robert Wood Johnson Health Care Pioneer in 2015. The Intelligent Optimist (formerly Ode Magazine) selected Dr. Sood as one among top 20 intelligent optimists helping the world to be a better place. In 2016, Dr. Sood was selected as the top impact maker in healthcare in Rochester, MN. Holding my daughters as a newborn. Receiving hugs from grateful patients. Savoring the presence and sense of humor of Bill Coors as he turned hundred. Supporting and speaking at Senator Elizabeth Dole's Hidden Heroes Campaign.